Rabbits are relatively easy to care for and make friendly, intelligent house pets. There are over 60 breeds of domestic rabbits. The average life span is 6-10 years, with a record of 15 years being reported. In general the medium and larger breeds live longer than the dwarf varieties. Like all pets they require proper health care and attention, and a decision to acquire a rabbit must be viewed as a long-term commitment. Rabbits make such good house pets and can be easily litter trained. However they love to chew and can be destructive to furniture and carpets. It is best to supervise your rabbit whilst loose in the house, and to have a secure cage or pen that it can be kept in when you are out or on a night time. It is also wise to take measures to prevent chewing of electrical cables – a potentially dangerous pastime! Outside rabbits may be housed in a hutch, but should always have access to a grassed run. Cages should be as large as possible and allow the rabbit to stand up fully on its hind legs and perform at least three consecutive hops. No hutch can be too big, but minimum sizes are 60x24x24 inches per average rabbit. Large or giant breeds will require more space than this. The hutch should be divided into an enclosed sleeping area where the rabbit can hide and larger area for daytime use. Housing rabbits may be kept on soft towels, or shredded paper. Outside rabbits may be kept on wood shavings and straw. Straw is a better alternative to hay as a bedding material as the latter is easily flattened and gives little warmth. Barley straw is recommended as it is softer than wheat or oat straw and there is less likelihood of it damaging the eyes. 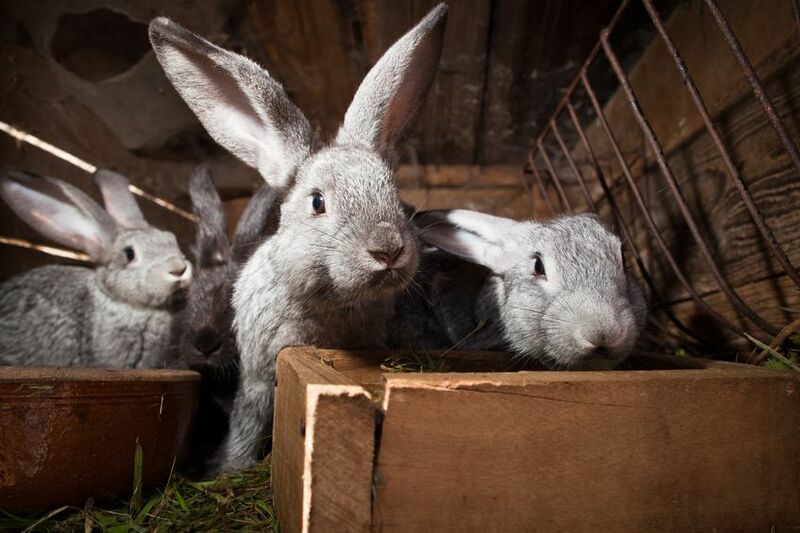 Avoid dusty or mouldy straw or hay, as this can predispose your rabbit to developing respiratory problems. Sawdust should be avoided as it is dusty and could irritate the eyes. How often should I clean the hutch or cage? It is essential, particularly if it is outdoors in the summer, that your rabbit is kept as clean as possible. You should check your rabbit twice daily, especially in the summer. Check for any signs of matted droppings, fly eggs or maggots around its rear end. Clean your rabbit’s hutch at least twice weekly and if possible removing any urine soaked bedding each day. The hutch may be cleaned with a suitable pet friendly disinfectant. Rabbits kept indoors should be in the coolest and least humid part of the home. Make sure that the rabbit is not to hot in the home (80 degrees F) has heat stroke may occur. Outdoor rabbits should have access to shade and be free from draughts, wind and driving rain. They also should be protected from dogs, cats and predators. Plenty of straw bedding in the winter and covering the front of the cage with a blanket at night will prevent your rabbit from getting hypothermia. Water bowls and bottles should be changed daily in the winter as they may freeze. What should I feed by rabbit? Feeding the correct diet to rabbits is fundamental to maintaining health, particularly of the dental and digestive systems. The best diet for rabbits is one that mimics as closely as possible their natural grass-based diet in the wild. Grass is approximately 20-25% crude fibre, 15% crude protein and 2-3% fat. The bulk of the diet of the pet rabbit should consist of grass. Green foods are also important and a variety should be fed daily to rabbits of all ages. They should be introduced gradually to weaning rabbits. Examples are broccoli, cabbage, watercress, celery leaves and carrots etc. All green foods should be washed before feeding. Wild plants can also be given – for example dandelion. Unlimited, good quality hay is the foundation of healthy diet for pet rabbits. Commercial concentrate rabbit diets are not essential if hay, grass and greens are freely available. Commercial rabbit diets can be to low in fibre and too high in protein, fat and carbohydrate. However many owners like to feed these diets for convenience. They should not be fed exclusively or be provided all day, and it must be emphasised that hay or grass should always be available and make up the bulk of the diet. Fruit should be regarded as a treat item and fed in limited quantities only as it is high in simple sugars and can lead to gastrointestinal disturbance and teeth problems. Sudden changes in diet must be avoided. Any change in diet should be made gradually over several days to weeks, starting with small amounts of the new item and gradually increasing them. Frosted or mouldy food and lawn mower clippings should not be fed as these can lead to severe digestive disturbances. Fresh drinking water must be available at all times. Drinking bottles are easier to keep clean than water bowls, and avoid wetting the dewlap, which can lead to a moist dermatitis. Your rabbit should be vaccinated routinely against Myxomatosis and Viral Haemorrhage Disease of rabbits. Both of these viral diseases can be rapidly fatal in an unvaccinated rabbit and there are no cures once infected. The only protection you give your rabbit is by vaccination. When picking up your rabbit always support its hindquarters, as this will prevent any spinal injuries. The rabbit’s spine is very fragile and will easily snap if the hind legs are allowed to dangle and the rabbit gives a strong kick. This will result in paralysis of the hind legs. One of the best ways to pick up a rabbit is to make sure your fingers are supporting the rabbits chest whilst your other hand us under the rabbit’s bottom, taking the bulk of his weight. Hold the rabbit close to your chest, the rabbit will feel nice and secure. A rabbit is for life, not until the novelty wears off, or your circumstances change.